Your children will love this fun list of books about dinosaurs. With their images and fun wording, you’ll soon have them roaring like dinosaurs! 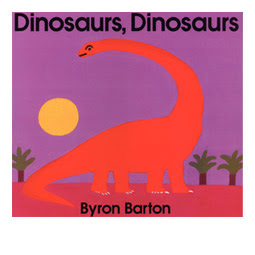 “Dinosaurs, Dinosaurs” by Byron Barton has always been a favorite of mine for introducing dinosaurs to young kids. It’s very basic, very bright and has the fundamental facts about dinosaurs without loading toddlers down with too many facts to sort through. The illustrations are bright, fun and descriptive on their own and will keep even the most fidgety 3-year-old entertained. 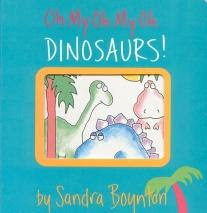 “Oh My Oh My Oh Dinosaurs!” by Sandra Boynton is a cute little book about opposites with dinosaurs as it’s characters. This is a good book for little people who love dinosaurs but aren’t really ready to dive into facts about dinosaurs yet. The melodic rhyming text and adorable pictures appeal to younger toddlers, and on the page where the dinosaurs are called bad for painting on their friends made both me and my son laugh. 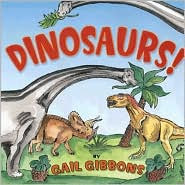 “Dinosaurs” by Gail Gibbons is an interesting and comprehensive introduction to dinosaurs for preschoolers. If you have a little one who wants to know more, this is a great book for them. It covers the basics and then some about dinosaurs and paleontology. 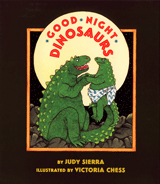 “Good Night Dinosaurs” by Judy Sierra is a tongue twister and I love it! I have a hard time pronouncing dinosaur names, but the cute little rhymes she writes to go with each really helps. The book is simple, parent dinosaurs tucking in and getting their little dinosaurs ready to fall asleep. Your child will love the catchy “Good Night Dinosaurs, Sleep Tight Dinosaurs, Good Night Dinosaurs, Goodnight!” I know I did. 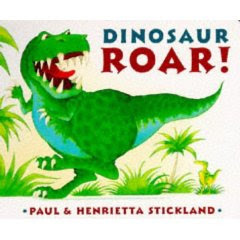 “Dinosaur Roar!” by Paul and Henrietta Stickland is a board book that I’ve read often enough, I don’t need to look at the book. The premise is simple, using 2 different dinosaurs every page illustrates a pair of opposites. 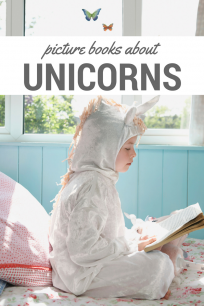 Toddlers and young preschoolers adore this book and I can’t blame them, it’s adorable and a great tool for teaching! 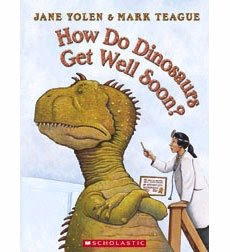 “How Do Dinosaurs Get Well Soon” by Jane Yolen is another favorite. I like the whole series and think this book is a great one to read before doctor appointments especially if you have a child like mine who is never happy to go! I love the details in Mark Teague’s illustrations and never tire of reading this book, even when my son grabs it again and again. Have you read these books about dinosaurs with your little ones? Are there any others we should add to this list? Comment below or share on my Facebook page! Next Post: More Alphabet Books! Great choices! 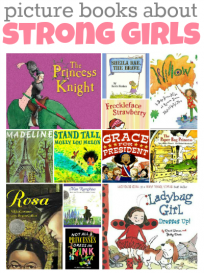 I’ve just added a lot of these to the “to be read” list on our blog. We just read How Do Dinosaurs Learn Their Colors, and I was wondering about the doctor’s visit one, because that is always a traumatic day around here. I’m happy to see your little guy likes it. If you ever get tired of reading the book over and over again, I know the library by me has it on DVD. It’s cool because the pictures seem to “come to life” and the narrator’s voice is very animated and fun to listen to, and gave my voice a rest when I was sick! We also love the two Dinosaur books by Deb Lund – All aboard the dinotrain and Dinosailors. These are fun books featuring dinosaurs; not true to life, but great fun! I will be happy to add your link to my sites blog roll. Best Regards to all from Italy.